Defining a true “Canadian” or “Ontario” taste has always been a source of debate, and this is only increasing as the demographic profile of Ontarians and Canadians shifts. The diversity of Canada�s population is expected to increase significantly in the next two decades, especially in the large metropolitan cities. Today, almost one in five Canadians identify with a visible minority group. By 2031, that number is expected to increase to one in three with 25-28% of the population being foreign-born and 29-32% percent belonging to a visible minority group. 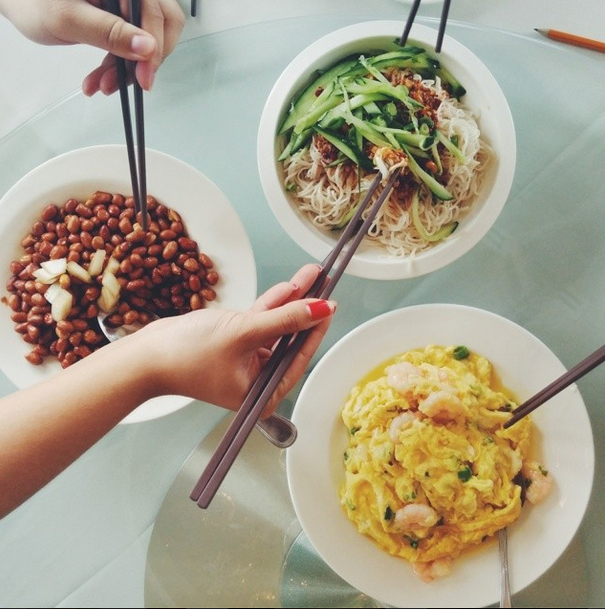 One of OCTA’s favourite road trips is heading to noodle country (Richmond Hill and Markham). As expected, Canadian food patterns are being influenced by the food preferences brought by New Canadians from their home countries. In the context of dining, a home culture�s influence on New Canadians� consumption of local food/cuisines is significant. For most New Canadians, eating local food is seen as a ?novel experience? and partaking in an authentic culinary experience allows them to become closer to their adopted homeland when immersed in an authentic local eating experience. Although New Canadians seek various and novel dining experiences, they often ?bring? their habits and preferences formed at home with them. It is not surprising that people generally prefer foods that are familiar to them. For Asian New Canadians, the addition of familiar ingredients and flavours (i.e. soy sauce, pickled vegetables) often provides a good entry point for approaching unfamiliar foods or cuisines. Diversification and fusion serve as an effective way to enhance the local food�s acceptability and palatability for New Canadians. It’s not just New Canadians that are seeking out these globally inspired flavours – ethnic foods are growing in popularity around the country. “Ethnic and street food appetizers” were recently featured in the Restaurants Canada 2014 Chef Survey as a “Top 10 Up and Comer” menu item, with Southeast Asian, African, Peruvian and Moroccan flavours being most predominant. Increasingly, culinary tourists are identifying themselves as adventurous diners. They are constantly seeking out new, authentic tastes and “off the beaten path” experiences. Millennials in particular are proving to be a very diverse generation, with tastes to match. In their report ?Understanding the Foodservice Attitudes and Behaviours of Millennials?, Technomic found that 41% of American Millennials are an ethnic or racial minority. Additionally, 88% of Millennials surveyed indicated an interest in trying new foods. Ontario’s agri-food industry is already responding to these trends and looking for ways to capitalize on consumers’ increasingly diversified palates. Research has shown that New Canadians spend up to 40% of their food budgets on vegetables. Annual sales at ethnic grocery stores across the country is estimated at $5M, and that number is growing by 15-20% each year [Source: World Crops Project]. The Vineland Research & Innovation Centre began the World Crops Project several years ago to help identify ethnic vegetable varieties that can be grown in Ontario and meet demand among the GTA’s diverse residents. It is estimated that if even 10% of the ethnic vegetable market is displaced with locally grown produce, it would create a $73M market for Ontario farmers. Project organizers are working with Ontario farmers to provide education and resources around growing these ethnic vegetables, which include okra, long beans and Chinese eggplant. No need to call the Colonel, this KFC sandwich stands for Korean Fried Chicken. Ontario chefs and restaurateurs are also adapting to meet these new demands. Marrying local products with global flavours has been an exciting trend and our Feast ON chefs are leading the charge. But don’t take our word for it – hit up Waterloo’s awesome Taco Farm for a smoked pork belly taco using Perth Pork Products or snag a Korean Fried Chicken sandwich from Sanagan’s Meat Locker in Kensington Market. Want to crunch more numbers? Check out the Tasty Tidbits archive or contact us to arrange for something from our wide world of webinars list!